A fad diet is a stylish weight-loss plan that promises dramatic results. Typically, these diets are not healthy and don't result in long-term weight loss. In fact, some diets actually can be dangerous to your health. Fad diets often limit your food choices or require you to eat the same foods over and over again. After a fad diet, you could end up gaining back the weight you first lost. If you don't know what is happening to your body when following a diet, you can make your health go down. You can be underfed, neglected of important nutrients, and much more. You have to understand the lifestyle you're going by. Simply, we are not adapted to that type of lifestyle or our bodies doesn't approve of it - So, here is what I recommend! I recommend doing a trial-and-error with all types of diets. Diets are to improve your quality of life, it's not a chore. By knowing what your body likes and how it reacts with it, you can easily manipulate your body without struggling as most people do when they diet for a long time but hitting a plateau sooner or later. Fad diets fail because people have no general knowledge about themselves nor the diet they're following. You must understand the roles of nutrition, food, health and your body. 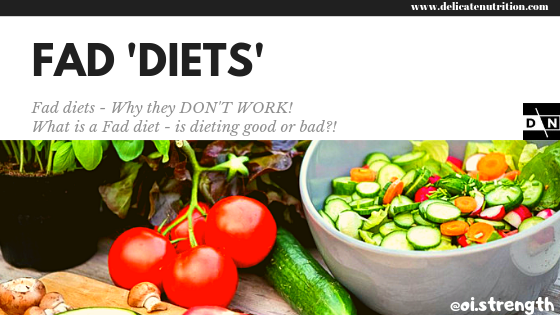 Nowadays, I see many people coming up with these crazy ideas for dieting; I believe it's a money scheme and that's why many many people end up failing their diet; simply because they just Follow! Correct me, but you have to understand life a bit more to achieve what you want. Watch the Macro-nutrient count; Carbs, Fats and Proteins. Don't go excessive on the carbs or fats or the proteins! Limit the Sugar intake. Eliminate/remove/use in moderation of junk food like Sodas. You also have to consider your own health and will it cope with that type of diet. Like Diabetic people, they cannot go about certain diets because it will harm them. Food can cause inflammation, which we do not want and want to avoid, so learning about foods or diets is complex as I mentioned. Trail and error is the best result you can get. No one else knows your body better than you. Comment if you have any tips, want to share anything or have any questions.